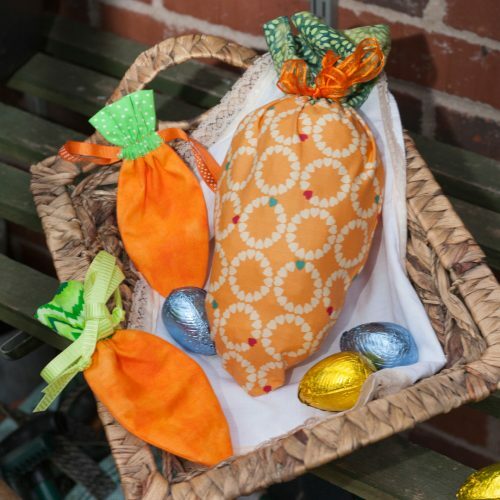 Crafters Companion > Blog > Brighten up Easter With These Carrot Treat Bags from Lizzy! Brighten up Easter With These Carrot Treat Bags from Lizzy! Celebrate Easter with these adorable Carrot Treat Bags! Fill them with sweets and give them as a special gift! Use the template to cut out the fabric for each treat bag. For the larger version you will need to double the size of it. Fold and press the short end of the carrot top panels 0.6cm (¼”), wrong sides together, and topstitch them. Stitch a carrot top panel to a carrot base panel along the raw short ends, right sides together, and press the seam. Repeat with the remaining carrot top and carrot base panel to create each half of the treat bag. Place the halves right sides together and stitch the sides, leaving the short end of the carrot top open. Clip the curved seam, turn the bag the right side out and press it well. Turn in the open carrot top so the topstitched seam from Step 1 covers the top raw edge of the carrot base inside the bag. Draw a line 1cm (½”) up from the bottom carrot top seam on the right side. Stitch along this line and just above the top seam of the carrot base to begin creating the casing for the drawstring element. Use embroidery thread for this if you’re creating the smaller bag. Use an unpicking tool or embroidery scissors to unpick the side seams of the bag between the lines of stitching for the casing. Fold the bag panel right sides together and stitch down both sides using a 0.6cm (¼”) seam allowance. Neaten the edges with a zigzag stitch and turn it to the right side. Starting at one end, use a safety pin to insert a length of ribbon through both casings, exiting at the same side. Repeat with another length of ribbon from the opposite end to create the drawstring element. Fill your bag with treats and gently pull the drawstring fastening to keep your Easter treats safe!